Using ExtendedFileInfo Project to avoid a System.IO.PathTooLongException. the ExtendedFileInfo is what you are searching for. I had the problem at a project where the path where xml configuration files where saved and the name of the xml file exceeded 260 chars. The use of that files where covered over the whole project so i had to find a global solution that uses no FileInfo class if the path and the filename where longer as 260 chars. To accomplish that i implemented the ExtendetFileInfo library and i put it to codeplex. It works the following way, if i access a file the library checks the path and if the path is too long it uses the windows api functions to access the file an no PathTooLongException is thrown. I implemented a IFileInfo interface that is used to hide the calls to the windows api or to a FileInfo object. 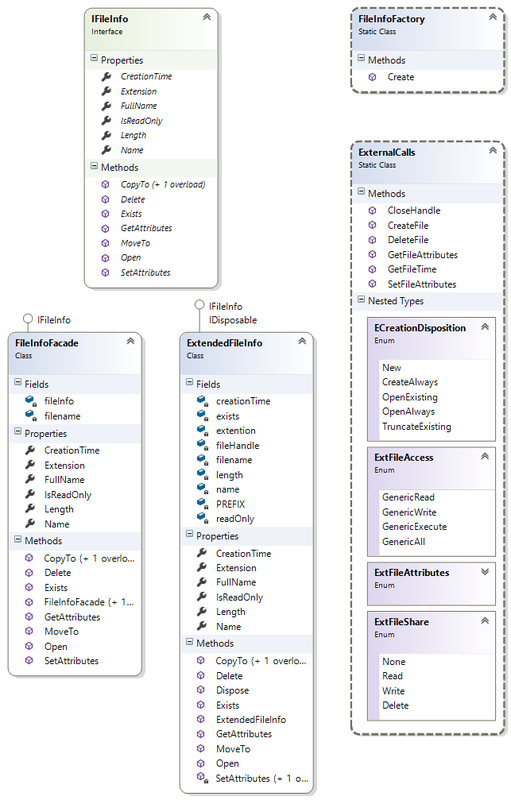 That means you can use all that methodes and properties like you would use it with a .net FileInfo object. So when i had that problem in my project it took me a lot of time to find the correct winapi calls and use them the correct way. So i thought if someone has the same problem it would be nice to just include a dll and the call to the FileInfo object works again.